The province of Quang Ninh is famous for its scenery, its people and its culture, but not many people know about a unique dish that can only be found in the northern locality. 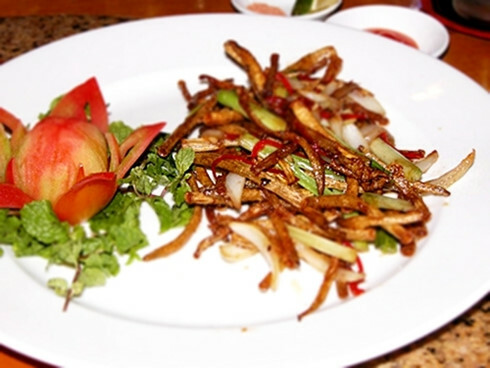 The special seafood dish is called Sai Sung or Sa Sung (sea peanut-worms), just another reason why one should not turn down a trip to Quang Ninh. The land of Sai Sung is the sea area near the coastline of Van Hai Island Province, especially Minh Chau or Quan Lan districts. The Sai Sung worms live on the seashore where the tide rolls in and out every day. When the tide is out, people have to search for the worms quickly, digging in the sand with their bare hands. A good digger must be familiar with the job; his experience enables him to perform quick, skilful movements as if he is dancing on the shore. The worms found are then fried with fresh garlic to create a tasty and buttery dish. This fried food is also called Moi Xao, a distinctive and popular food of Ha Long. Another way to serve Sa Sung is to dry them before roasting. When the dish is done, it has a tempting yellow colour and flavour of sea salt. When eating, Sa Sung worms can be dipped in chili sauce. Not everyone has had the chance to taste this special dish, but anyone who did will agree that the combination of fried Sa Sung, fresh lettuce and beer is something beyond delicious.